Honda’s subcompact SUV gets a few changes and improvements for the 2019 model year, after three years on the Canadian market. It still faces rivals such as the Mazda CX-3, the Jeep Renegade, the Hyundai Kona, the Nissan Qashqai and many more. The HR-V benefits from a restyled exterior, with new bumpers, grille, headlights and taillights. In addition, a new Sport trim has been added with two-tone 17-inch alloy wheels and blacked-out trim, while the Touring version—the most expensive one—obtains LED headlights and fog lamps as well as dark chrome trim. The Orchid White Pearl paint has been replaced by Platinum White Pearl, and Orange Burst Metallic is now available on the Sport and Touring trims. 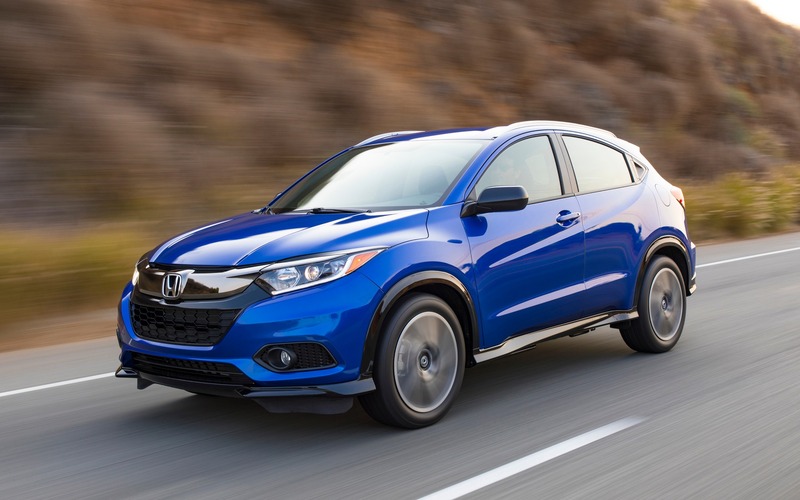 The 2019 Honda HR-V is now equipped with the Honda Sensing safety suite as standard on all versions. This suite includes collision braking mitigation, front precollision warning, lane departure warning and lane keep assist, road departure mitigation and adaptive cruise control. Under the hood, we still get a 1.8-litre four-cylinder engine that develops 141 horsepower and 127 pound-feet of torque. The manual gearbox is no longer available in 2019, which means the continuously variable automatic is now fitted as standard, which obtains refinements in order to improve the driving experience and provide quieter operation. Le base LX trim is available in either front-wheel or all-wheel drive variants, while the latter is included in other trims. As always, the 2019 Honda HR-V is equipped with the Magic Seat setup. Aside from 60/40-split seatbacks, the cushions can be flipped upwards for transporting bigger objects. When the rear seats are folded down, maximum cargo space grows to up to 1665 litres, making the HR-V one of the most spacious SUVs in its category. The 2019 Honda HR-V will be on sale early in 2019 and will start from $23,100 before freight and delivery charges.